Bianchi’s Aria has new beefed up tubes and disc brakes, but still looks to be an aero-optimised frame, so we were keen to see how it rides. Gary Hunt reports. 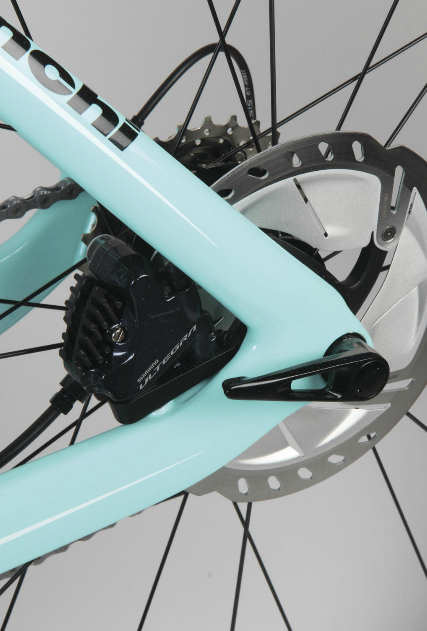 Bianchi’s website is promoting the Aria Disc with a headline “Master the Elements”, pointing to the performance enhancements that disc brakes can offer. The number of naysayers seems to be diminshing, and consensus seems to have shifted in the market so that disc brakes are now openly being touted as a beneficial feature. Sporting sleek tube shapes, blade style fork legs, internal hose routing all tends to suggest the Aria being a dedicated aero bike, but it’s more than just a one trick pony. 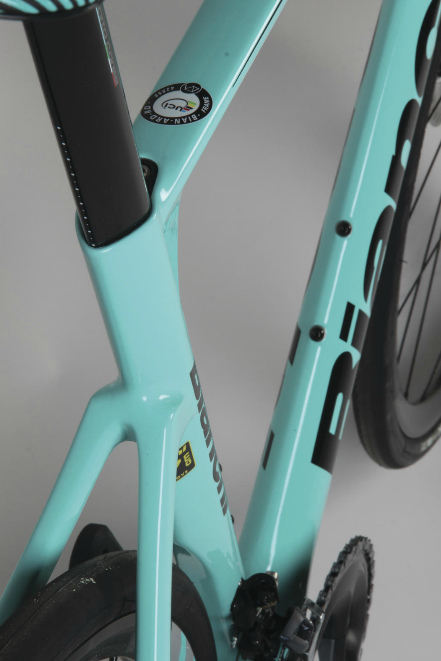 The Celeste colour tends to split opinion but Bianchi does offer alternatives. That said, by the end of this review the green and black livery was growing on me. The Aria’s frame has been heavily inspired by Bianchi’s time trial and triathlon model the Aquila CV which did see some wind tunnel testing. It’s also suggested on their website the Aria is tri-ready; just clip on some bars, adjust stack spacing and saddle angle and you’re ready to go. Aero efficiency with the stopping power of disc brakes. The down tube certainly looks to have an aero profile with a hint of a cutout for the front wheel and being 78mm deep and just 38 wide, tapering to Kamm trailing edge. This blade-like down tube section transitions to an 86mm wide bottom bracket which anchors a stout looking rear triangle. The chain and seat stays look seriously over-engineered...those chainstays are 46mm deep (though only 19mm wide). The nett result of this chunky rear end is a ride well able to handle all the power you can produce and a one that’s very stable confident and assured into the bargain. It’s definitely a firm ride, though I wouldn’t go so far as to say harsh. The seat tube also has a shallow cutout for the rear wheel and the seatstays while sturdy, are low set, again looking for that aero advantage. The triangular section top tube tapers evenly from the headtube, giving the appearance of a waist at the seat tube junction where a hidden wedge-style clamp binds on the aero post. While not overtly aggressive it’s a speedy looking machine. According to the importer Bianchi has always maintained the perspective that their bikes must be strong and solid even if at the expense of being the lightest available. This kind of ‘safety first’ philosophy sits very well with me as tall and solid rider who likes to head downhill at speed. It almost always results in a more direct-steering frame too. Shimano’s Ultegra groupset is a pleasure to use, smooth and quiet while changing gears, the difference between this groupset and that of big brother Dura-Ace really is quite hard to pick in a performance context, with weight and bling value being the real difference in my view. Shimano’s 160mm Ice Technology Freeza rotors are the strong silent type and braking performance is exceptional — as you would hope given Bianchi’s ‘master the elements’ marketing pitch. Modulation is very good, and given the power of these brakes this is essential. As I have come to expect from late model disc braked road bikes there was no squealing from the brakes, though I did I did occasionally get some rotor rub while climbing, both front and rear. This can stem from a level of flex in the frame and fork, or be a function of close tolerances between pad and rotor, or be the result of some warping of the rotor after heavy, heat-inducing braking. These last two points seemed to be the contributing factors as the rub came and went quickly after descents. Fulcrum’s alloy wheelset is functional and cost efficient, but the Aria would be better suited to some deep carbon wheels. 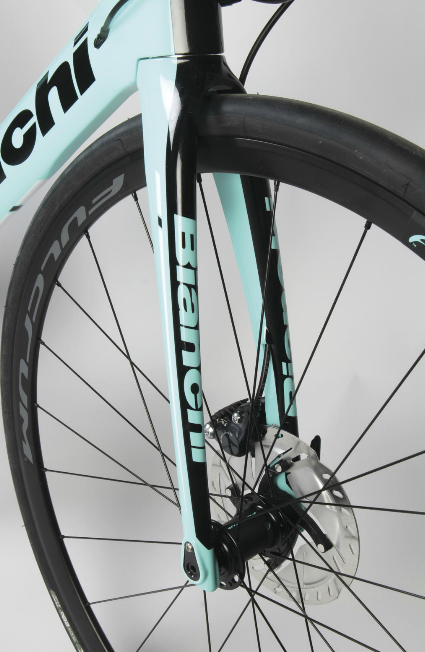 Bianchi has fitted their house brand ‘Reparto Corsa’ (literally ‘Racing Department’) alloy bars and stem to the Aria. This large (57cm) frame comes with a 42cm wide bar which they suggest is a flat top unit. Personally I prefer a wider bar, (though the aero leanings of the Aria could probably justify something narrower), and something a little flatter on the tops. If anything lets the Aria down it would be these two items; they are functional and no doubt helpful on the cost control front, but the rest of the bike is so well appointed these look slightly underdressed. Similarly the Fulcrum Racing 618 wheelset is solid and functional but I’m sure would happily be redeployed to training duties if you were to upgrade to a deeper more aerodynamic set for racing. There’s no doubt that, even though they’re not at all necessary, the frame could admirably accommodate any upgrades here. For all the emphasis the frame’s sleek profile infers on aerodynamics I found the Aria to be quite a strong performing all rounder. Descending on this bike is a real pleasure. After the first few descents of my test route I was achieving times within my long-standing top three best, and seemingly with ease...it was enough to make me take on hill repeats just for the fun of the descent! Carving wide arcs or ripping tighter corners on the Aria is a blast that I didn’t foresee. I’m sure the 28mm tyres contribute strongly on this front, but the frame must also shoulder some of the responsibility for this fun and motivating ride. Stability of the Aria ride comes in part from sturdy rear triangle tubes and thru axles. A quality carbon frame sporting mechanical Ultegra gears and hydraulic disc brakes...it’s a recipe for success. Bianchi has left the ball in your court as to the need for wheel upgrade. While the Aria Disc looks to be a dedicated aero machine with time trial intentions it’s a strong all rounder. It is powerfully built and the resulting ride is firm. Descending and cornering at speed feels assured and the Aria spurs you on, repaying confidence with yet more speed. The Aria’s low set stays aid stiffness and power transfer and contribute to lowering drag. While there are other Ultegra equipped bikes on the market for less dollars, there’s a level of quality that comes from the learnings of many years, and certainly one that is evident in the Aria. I found the the Aria Disc a very well designed bike: the whole package of frame and components is a harmonious blend. It performs very well especially when playing to its strong suits of power and speed. A very enjoyable ride.